MACHINE WASHABLE:Wash Time after Time, Saves Money in Buying Wipes or Paper Towels, Environmentally Friendly with Less Waste & Healthier Option for You, Having a Clean Cloth Every-time. COMFORTABLE TO USE: At 12 x 12 inches, This Cloth is Not Only Comfortable to Use with One Hand but Large Enough to be Light and Easy to Handle around the Home, Car or Office, for Every Day Use. SAFE TO USE EVERYWHERE: Non-Abrasive, Lint Free, Anti-Static, Water Absorbent, Safe to Use on Furnishings, Electronic Equipment, Screens, Dashboards from Domestic to Commercial Properties. 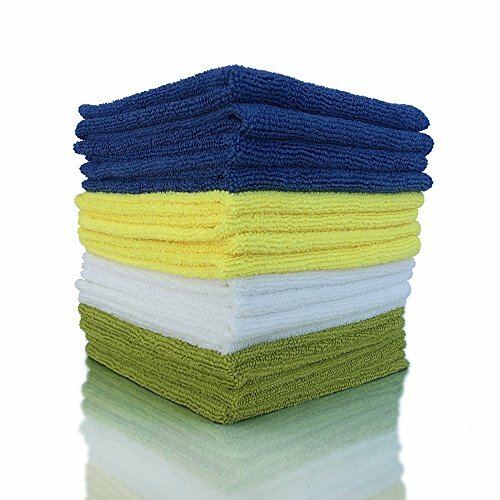 4 DIFFERENT COLORS 12 CLOTHES: Allocate to Different Cleaning Areas with 3 White, 3 Blue, 3 Green and 3 Yellow in a Package. Cleaning around Areas is NOW Much Easier just Assign a Color Cloth for Kitchen, Car, Windows, Laundry, Bathroom, Glass etc. 100% MONEY BACK GUARANTEE: To Lift Dirt, Clean Grime and Take away Residue with an Easy Wipe, Safely around your Home, Car or Office or YOUR Money Back. If you have any questions about this product by ViroKleen, contact us by completing and submitting the form below. If you are looking for a specif part number, please include it with your message.